New York Toy Fair 2019 is upon us, and Hasbro have shifted into gear early by knocking out a few early reveals for its Transformers Siege: War For Cyberton toy line. So on the off chance you completely missed this toybox shattering news, join me as I take a break from the all absorbing Kingdom Hearts 3, to have a quick look over the early reveals. And of course, find ways to shoe horn in obscure references to completely unrelated things. 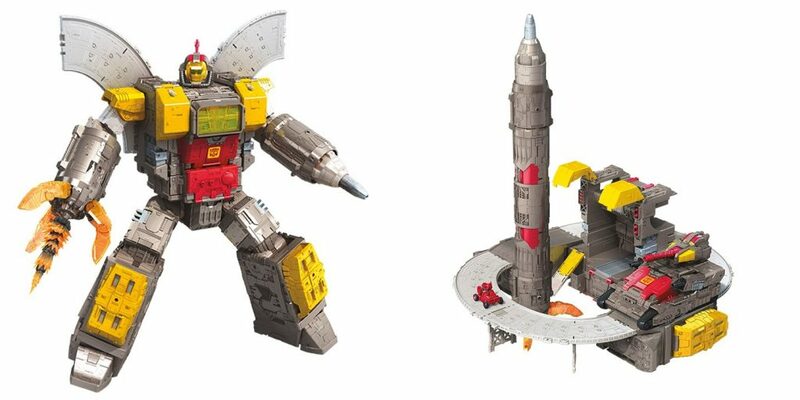 One minute you are sat eating Pop Tarts, watching old episodes of Knightmare, wondering why David from Leeds is struggling to side step to the left, the next Twitter is heralding the arrival of a Titan Class Omega Supreme. Life eh? We’ve known for some time that Omega was the next Titan Class figure looming on the horizon, but it’s still no less stunning to see it fully realised. Or at least materialise in the form of a render. The amazing thing is they’ve continued to retain and build upon, all of the elements that made the original toy so cool, which has been one of Siege’s best feature so far. Omega is a huge toddler sized robot, that’s as G1 as you’d want and the only thing setting off Solid Snake exclamation marks above my head is that face. It’s a bit…Emoji movie. Base mode is G1 but turns the tracks into a railway bridge. The tank is just perfect, also allowing for a Micromaster to ride Omega as an attraction at Disneyworld. The rocket is less of his traditional rocket and more of a frickin javelin. I swear on bonfire night I’ve seen people light fuses on those things. It’s fun, but as everything else is so on point, looking more like a realistic rocket seems a little off. Interestingly it seems that both arms are actually one connected piece that pops out of the back which explains why it’s so long. Hopefully there is a way to pop the forearms off at the elbows to produce a more iconic rocket form. Included with Omega Supreme is famed Richard Whiteley impersonator – Countdown. A Micromaster who’s original vintage toy came with it’s own rocket base, it’s a really nice, consistent way to get him a new toy without feeling like he’s missing something. Props to the folks at Hasbro who with Siege really seem to be thinking through every character pairing and reference. Countdown can ride around Omega’s track in his moon buggy alt mode and that whole thing is just perfect. It really is. For the last week or so a mysterious listing for an unnamed Commander Class figure has baffled enquiring minds, being as it’s an unprecedented new size form. As if announced to Bobby Roode’s “Glorious” theme tune, the surprise turned out to be a brand new Jetfire toy. 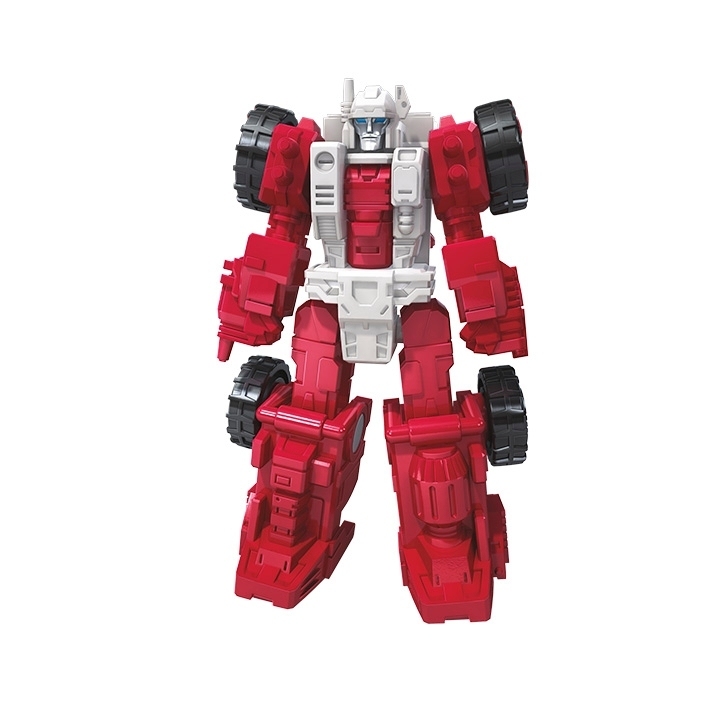 Heavily G1 animation based, it is pretty much the Skyfire I’ve always wanted, being as we’ve never truly had an official toy of that design. We’ve had a few near misses, with Classics and the T30 Leader using elements, but nothing official that actually nailed Skyfire’s unique stature. X2 Toys Skycrusher did a great job standing in, but this guy is everything I’ve wanted. Just look at him. He’s cartoony, but covered in detail lines of the sort of thing that result from a beer fuelled night with an Etch-A-Sketch. For the G1 toy/ Macross traditionalists, there’s armour pieces but those are very much in the “added value but destined for the part drawer” pile. The last time I got this excited for a toy was the T30 Jetfire, so clearly the character holds some kind of spell over me. Probably arising from being a kid and my cousin claiming he had a Skyfire toy that looked like the cartoon, but was not allowed to show it to me. Course I believed it, I was only about 6 and England’s defeat to Germany in Italia, that robbed me of my innocence, was still some ways off. Nobody other than himself expected him to look this good. Mirage is the “if the F1 was held in space” sort of vehicle you’d expect and Siege’s signature extra detailing rescues the robot mode from the blandness that can often afflict anything based on Sunbow’s low detail animation models. Here the cartoon marries with modernity to create a brilliant looking robot form, and Hasbro even thought to equip him with both his rifle AND rocket launcher. Sideswipe is currently sobbing over in the corner. Fun references can be spied across the toy with the Cybertronian sponsor logos on the sides being a very under the radar way of spelling out Citanes. 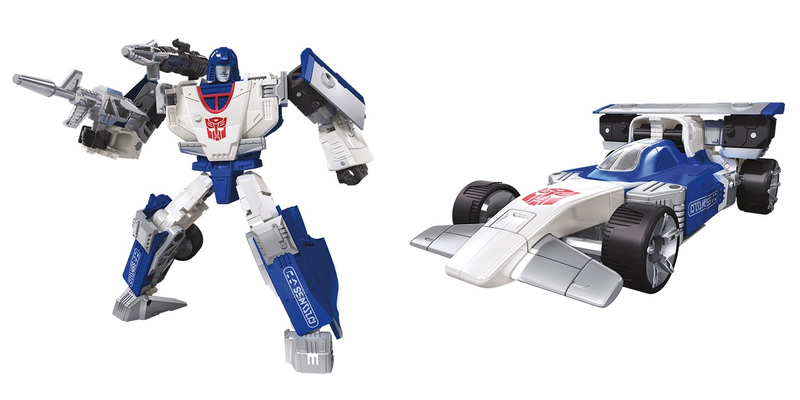 Obviously these are just renders, but you can still suss that the transformation deviates massively from what we’ve come to expect from your typical Mirage figure. The arms form the rear of the car, in particular the spoiler which looks less aerodynamic and more like a small wall. As a Brit, I am probably about to do something approaching Blasphemy when I say I do not care about Impactor. Not this toy, it’s a very fun looking Cadburys Caramel coloured, duck beak cannon equipped space tank – but the character. No hate mail is required, he just wasn’t my jam and always felt out of place in the world of the Transformers to me. You know like when you play a video game of one of your favourite shows or movies, and they introduce a brand new super awesome character who nobody has spoken of before, and is only referenced again in the most obscure of ways in the core media? Yeah, that’s Impactor to me. Also all he did was rise from the dead to be mad about rising from the dead – then die. To be livid about it all in silicon heaven with all the calculators. If that is indeed where they go. The Toy looks fun though, and it’s nice to see that the option for a normal fist or harpoon hand is entirely your own. 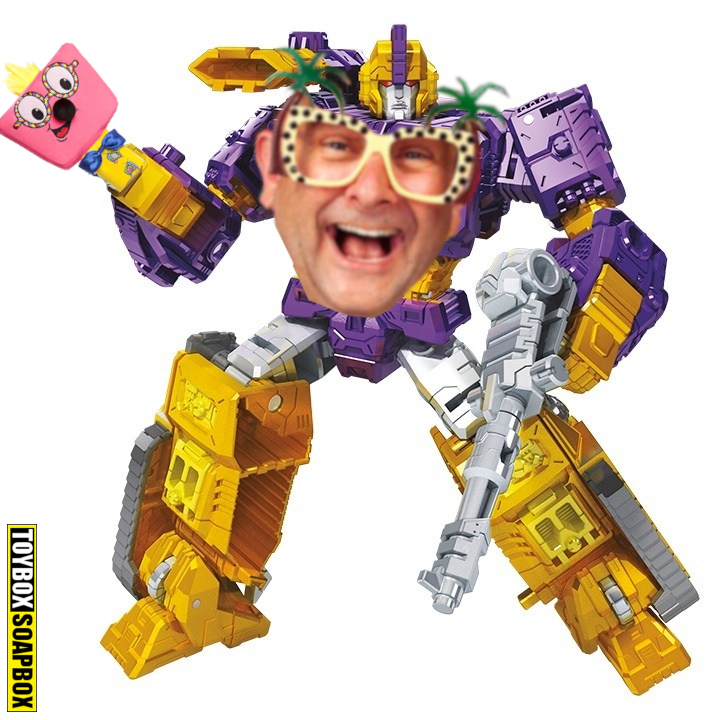 His shoulder cannon still resembles someone squishing Shockwave’s face though and most strangely his chest looks like Timmy Mallett. Or Chucky Finster from Rugrats for Americans, who obviously would not know what Mallett’s Mallet was. These are all renders so it’s still hard to judge how the toys will look in plastic and in your hands. Hopefully over the course of New York Toy Fair we’ll see all of these toys and a few more reveals to keep us salivating. Damnit, no! No, Hasbro is NOT getting me to buy a THIRD progressively more expensive Jetfire CHUG toy! The Leader one was already good. Hell, the Classics one was already good! … And this thing looks like it just destroys them both. Curses. It bugs me that I can so clearly see Omega’s leg in base mode. These Titan molds really haven’t gone all-out on the transformations, have they? This Mirage just doesn’t do anything for me; it’s fine, but looks worse than the Classics mold (which, to be fair, is really, really good). 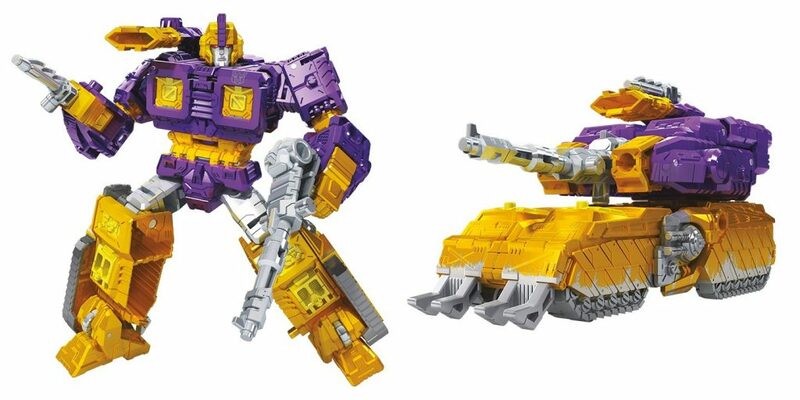 Also, wasn’t this supposed to be a 2-pack with Impactor? Wasn’t the whole reason people voted for this because they wanted Impactor? Sigh. I guess it can’t be easy for HasTak to make CHUG toys after 12 years of continuously making CHUG toys that mostly reference 4 years of G1 source material, while still making releases feel essential. But dangit, Siege has made me a believer again, and I want to believe! Totally agree on Jetfire. Both previous toys were great but this is just another level. I do really like the Mirage and he was meant to be part of a two pack, but at least both are in the same wave (I think) so it’s like getting a two pack. Sort of. But not really!!! !